The Glidecam HD4000 Stabilizer is a lightweight solution to most dynamic video stabilizing needs. It works with the user's body, the camera body, and a variety of stacking weights to provide a smooth, floating moving image. Note that this Glidecam does not include a quick release plate like the Glidecam HD2000 Stabilizer System and Glidecam HD1000 Stabilizer System do. A Rapid Connect Adapter is rentable separately. 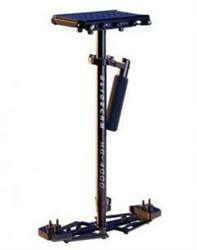 For larger loads, rental of the optional Glidecam Body Pod Stabilizer is recommended. • This Glidecam does not include a quick release plate like the Glidecam HD2000 Stabilizer System and Glidecam HD1000 Stabilizer System do. A Rapid Connect Adapter is rentable separately. • For larger loads, rental of the optional Glidecam Body Pod Stabilizer is recommended. • Post Telescopes from 20"-28"